It's All about PowerPoint & Education. 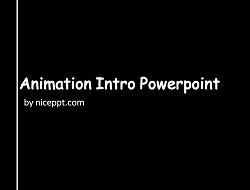 Simple opener animation for powerpoint. 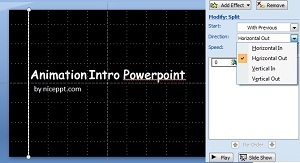 When using powerpoint we need an introduction to make powerpoint interesting, just simple animation to make people understand what we will show. There are not must make animated opener, but that is my habit so i will show you the way to make opener animation. 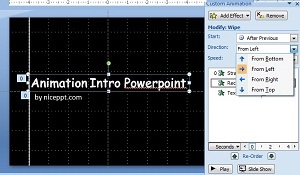 There are many opener animation that you can make in powerpoint, one of them is animasi pembuka untuk powerpoint. But unfortunately that article in indonesia language, if you still want to studied you can download it from there. Now we gonna make simple animation opener. This animation not pretty hard, just simple animation that line will show from middle, after that the text appear from left to right. How to make it? just make formation like that picture, left side is a line and little to the right is text. After you make composition like that, now we will give animation. but may be will be nice if you showing grid on powerpoint first. Now you click on the line, after that you give split animation. not finished yet boy, now you customize animation on direction, make it move horizontal out. look at the picture below to make it clear. Second step is giving animation into the text. first click on that text, now give wipe animation, choose from left direction. give random bar animation to the other text. now you get animation that will make simple animation opener, to show it click on show in the bottom right side.